In Japan Electrical appliance shop, demo version of Taiatari is installed in iPhone for demo. 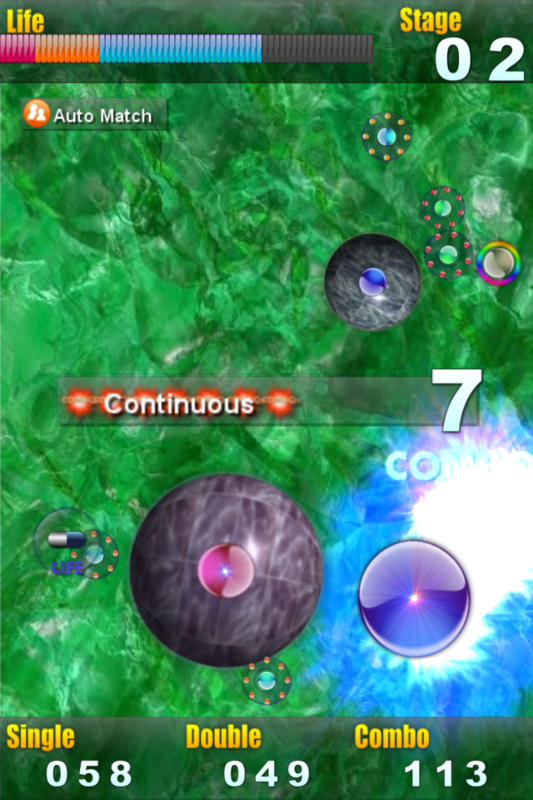 Tilt iPhone, manipulate MyBall, and Let's hurl oneself to the enemy. It becomes a combo if it attacks it continuously. The score goes up rapidly when the combo is fired in rapid succession. You can online match up on Game Center. 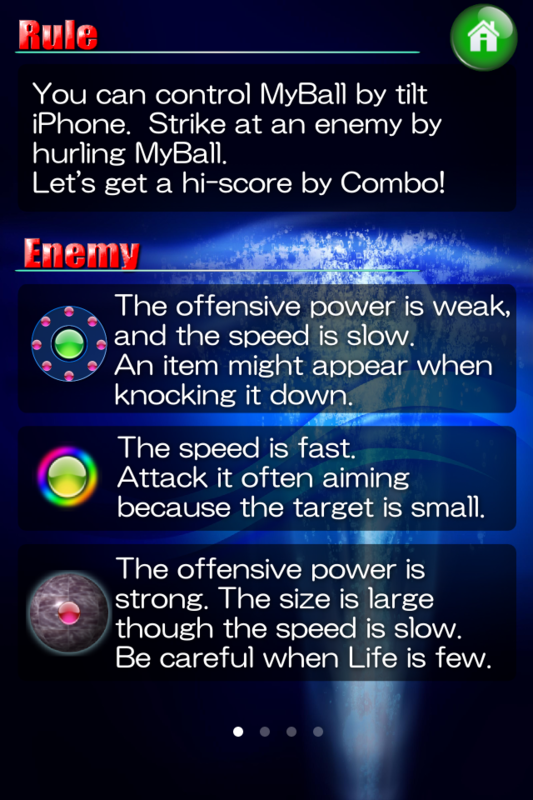 Because MyBall also has damage when the enemy is attacked, I will attack the enemy while noting the residual quantity of the life. Let's get the item and improve to aim at a high score. The life improves when the item of the capsule is taken and the upper bound of the complete recovery and the life improves, too. The life is increased and the combo does to one's heart's content. If star's item is taken, MyBall will grow. Grow up fast greatly, and knock down the enemy one after another. It transforms to Super Bowl that MyBall shines to the iris when greatly growing up to MAX. 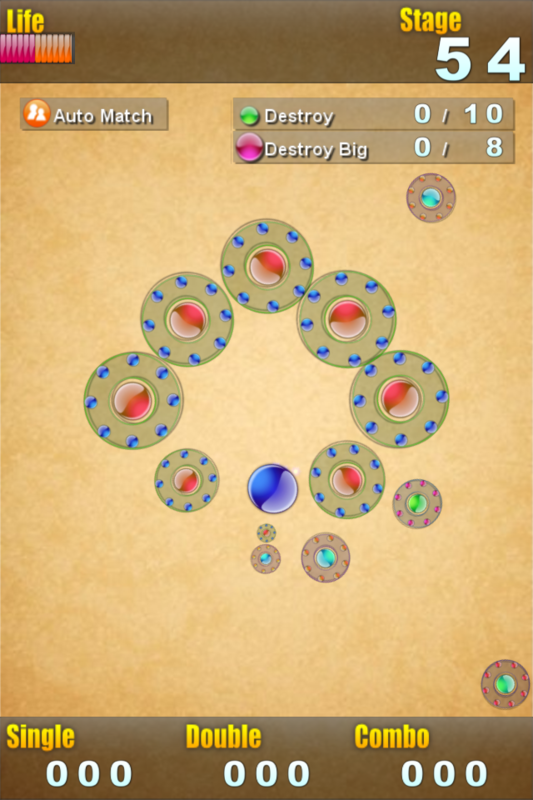 It becomes invincibility during the fixed time and the sweeping roundup of the enemy. Attention of reset of effect of item when item of skeleton mark is taken carelessly, and return of life and size to origin. Please single-mindedly roll the ball of the machine and hurl oneself to the enemy. MyBall can be intuitively manipulated with the acceleration sensor according to the desire. 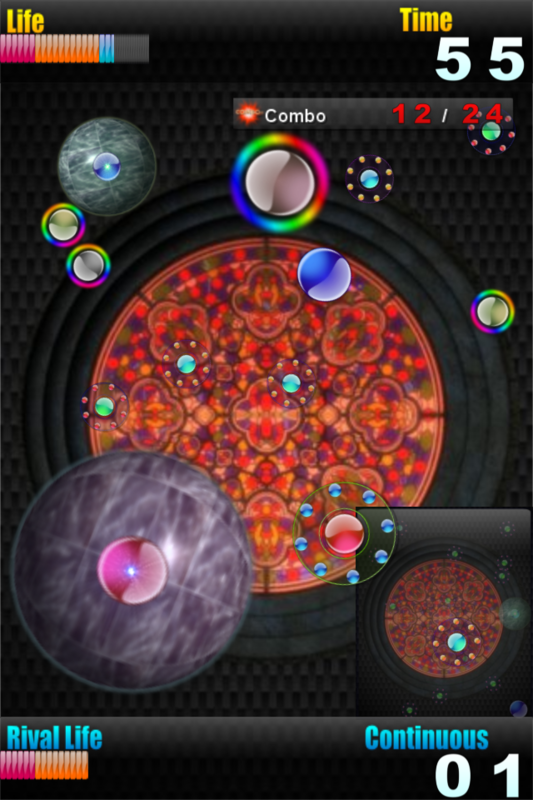 A player all over the world and the score can compete because it is Game Center correspondence. There are five game modes. 1.The EASY mode fights by the time restriction of one minute. There is one kind of enemy. To manipulate MyBall here according to the desire, let's practice. 2.The NORMAL mode also fights by the time restriction of one minute. Three kinds of enemies will become tough. Do it endure to you you for one minute? 3.The SURVIVAL mode is real pleasure of this game. Let's fight until the machine is unrestrictedly destroyed at time. The enemy notes that the enemy of the mutation in addition to three kinds of similar NORMAL shows up. The difficulty will improve every minute the stage and go up. 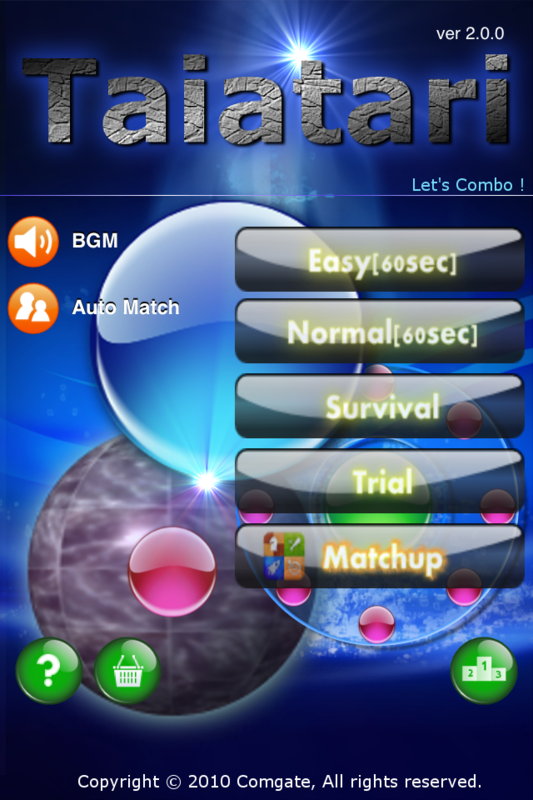 4.The TRIAL mode is that clears the set condition of each stage. When you take the concealed flag, the medal can be gotten. At present, it prepares it by 24 stages in all. Still, it is scheduled to increase it. 5.The MATCHUP mode, You can match a rival. Online matchup on Game Center. The fate, courage, and the arm are necessary for the rule to aim at easiness and a high score. And, aim at the combo anyway. Because poisoning is high, it is likely not to be stopped though this game can enjoy one game in a short time. Please enjoy it after it notes it enough at the residual quantity of the battery and the time of meeting. Mejor version up. iOS 5 suppprt. Game center online matchup. Retina support. You can tweet score. To tweet score, you have to set twitter acount in iOS 5 setting.